﻿ Best Price on Casa Ramirez in Panama City + Reviews! Located in Panama City’s stylish Coco del Mar neighborhood, Casa Ramirez is 2625 feet from historic Panama Viejo. This boutique hostel offers a steam room, sauna and outdoor pool with poolside bar. 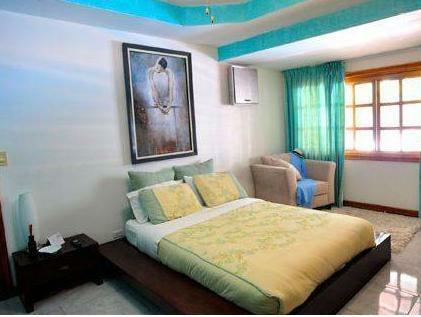 Rooms and dormitories at Casa Ramirez feature bright, attractive décor and free WiFi. There are private rooms with TV and private bathrooms, while other rooms and dorms offer access to shared bathroom facilities. You can enjoy a free breakfast of pancakes and fresh fruit from 07:00 until 11:00 daily. You can also relax in a hammock at the poolside bar, open until late. Casa Ramirez has a 24-hour reception and offers free private parking on site. Avenida Balboa is a 10-minute drive away, while Panama City International Airport and the Panama Canal are within a 20-minute drive. Airport transfer from Tocumen International airport to Casa Ramirez is available at an extra cost. Please contact the property after booking. Please inform Casa Ramirez of your expected arrival time in advance. You can use the Special Requests box when booking, or contact the property directly using the contact details in your confirmation.